Heard of all you before? All you is a magazine dedicated to its title. Its all about you and how you can live a better life. All you shows you ways to save money while still living life to the fullest. Saving money doesn’t have to mean that you go without or that you can’t have fun! All you shows you how to save money (and gives you lots of coupons to help) while still enjoying life! 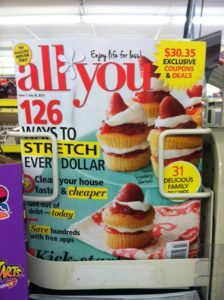 Each and every all you magazine includes numerous coupons, money saving ideas, frugal family activities, recipes, fun craft and decor ideas. A couple weeks back, I headed over to my local Dollar General store. And what was staring back at me at the checkout line? I didn’t have one large photo that I wanted to frame, but the all you article was about thinking outside the box for wall art, so I decided to take four – 4×6 black and white photos and form some monogram photo art with them against some wrapping paper. 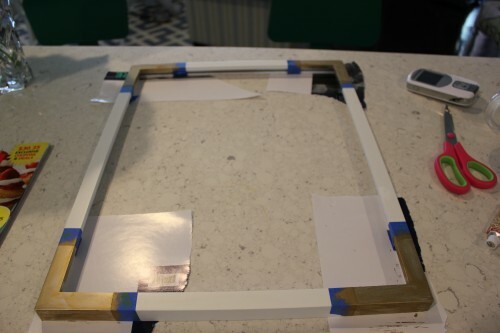 There was some paint that had been scraped off on one side of the frame, so I touched it up with some white acrylic paint. I wanted to add a little bling to the frame with gold Rub ‘N Buff, so I taped off the corners to keep clean edges and rubbed some Rub ‘N Buff on. I cut the wrapping paper to size by simply placing the glass on top of the paper and tracing the size onto the paper then cutting it out. I used photo mounts to attach the photos to the wrapping paper. So, what do ya think?! Thanks all you for the inspiration! How to Make a Silhouette the Easy Way – easy peasy! Sassy Fabric Covered Message Board – up the wow factor on those boring bulletin boards! Vintage Nursery Rhyme Art – so sweet and easy! Song Lyrics as Wall Art – turn your favorite song into art! 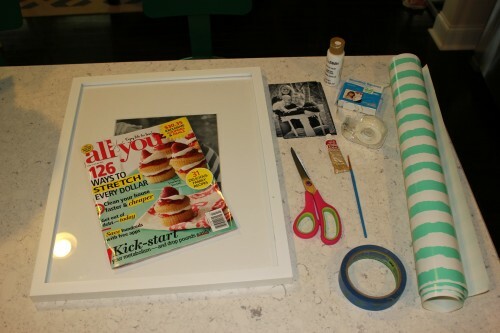 DIY Wall Art with Picmonkey – learn how to make your own art! That came out fantastic Jenna! I love the touches of gold, never would have thought to use wrapping paper, genius!! Thanks, Dria! I am starting to love working with wrapping paper! That is cute! I love how you did the gold edging! Thanks, Mindi! The gold edging is one of my favorite things too – now I want to put it everywhere! How cute! What a great idea! It turned out so adorable! awww I remember doing something like this before! What a classic. I have some family vacation photos framed in a way sort of like this one when I was a kid. 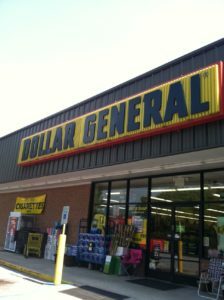 I don’t have a dollar general around my place so I have to look around.. Probably the bookstore might have it? It is classic! I love how it turned out! Your local bookstore might have it! I love this idea! What a fun way to spruce up an old frame. I will definitely have to try this. Thanks for sharing! Thanks, Katie! I’m so happy with how it turned out! Very clever! I can see doing this on a smaller scale, too, as gifts for family. Thank you for sharing the idea! Ooo, Karen, that is a genius idea! Thanks, gal! I love how it turned out too! Thank you, Carrie! Love linking up with you guys! Very cute Jenna! Love the wrapping paper and the rub n’ buff makes it look like it has metal corners. Love that! Thank you for sharing it at What We Accomplished Wednesdays. Have a great weekend! 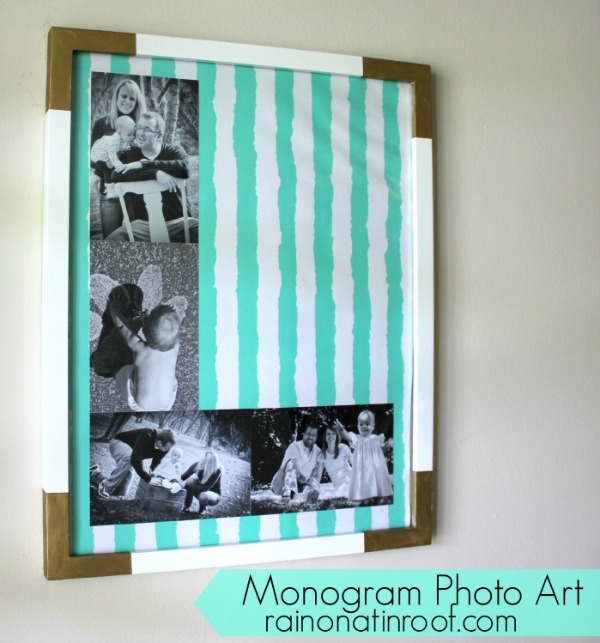 I love this wall art because it’s so frugal and easy to do! 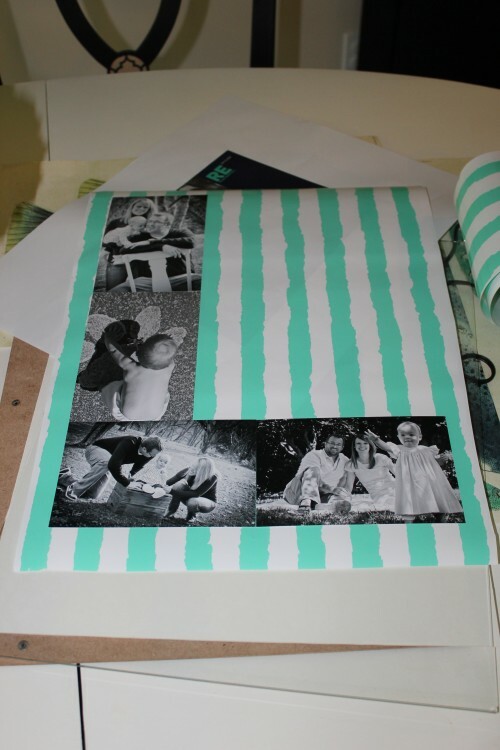 I’ve featured it in my Inspiring Ideas post and pinned it to the feature board! Thanks for sparking up some creativity in not-so-creative people like me! Thanks so much for featuring my wall art, Carrie! Yippee! Oh my goodness, I love this so much! 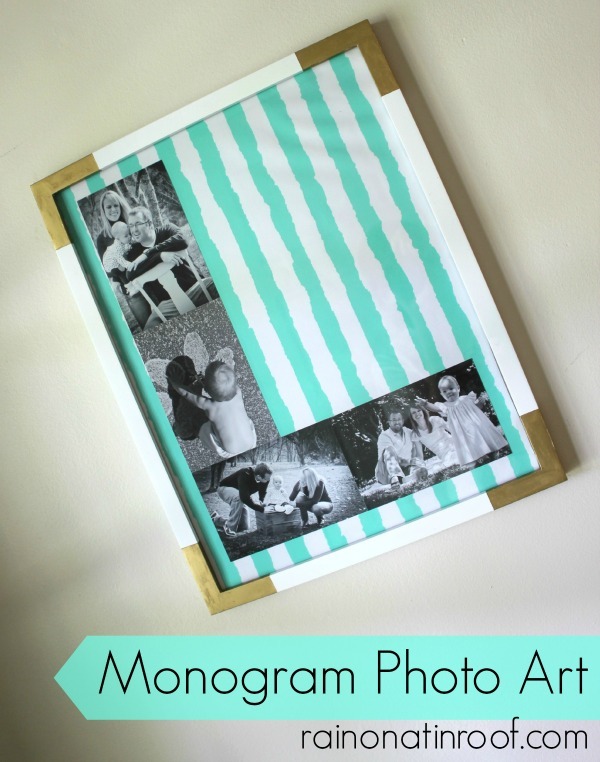 I love monograms, and this is such a neat way to create one! I’m going to have to make one for my home now! I’ll be featuring this on my blog tomorrow! Thanks so much, Sumo! Yay!! I’m so excited! This is so pretty! Love that magazine too! Thanks, Ruth! It was pretty simple! I will head over and link up! thanks for the invite! Love what you did with that frame. It looks so great with gold corners and the monogramed pics are wonderful. Great post. All you is one of my favs. I don’t use the coupons as much but give them to daughter/family. I get great ideas, good advice, all kinds of useful articles. Usually when I buy it I go thru the whole zine in one sitting. Then another time I’ll go back to really read articles. For the money it’s a pretty great read. I know, I love the magazine too! Thank you for such a sweet compliment! I still can’t believe it turned out so well!